[AUTO](VC/RC):When placed, COST [Counter Blast (1)], your opponent chooses one of his or her rear-guards, and retires it. 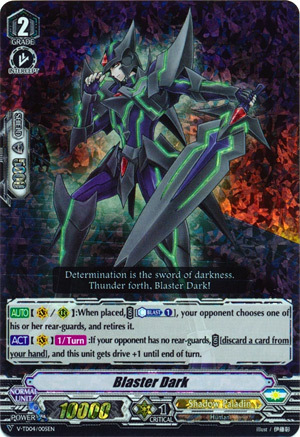 [ACT](VC)[1/Turn]:If your opponent has no rear-guards, COST [discard a card from your hand], and this unit gets drive+1 until end of turn. The avatar of darkness himself. The first skill is pretty standard for Blasters, except this retire is of a lower quality for a less steep cost. Understandable though. The second skill is a bit odd. It only works when the opponent has no rear-guards, but frankly, given his timing, that early in the game one retire from this ought to fulfill the cost just fine. Some may say “oh but you can play around this Twin Drive skill so he isn’t that good”. Um, are you retarded? Think about what you’d need to do to ‘play around it’. Assuming he’s going to hit Grade 2 first (this) how the hell are you going to fill your field with that much retire fodder just to avoid it? Your calls are restricted by your Vanguard’s Grade. And even if you do, what’s the point? What, are you going to call your low power, high-shield cards out just so they can be sacked? He’s still making gains from it because that’s now shield you can’t use anymore, gone. Or in the event YOU ride to Grade 2 first, I do grant you that you might be able to fill a field a bit more easily, but it’s hardly worth it since he might not even want to ditch anything at all, unless he opened like a sack of crap hand-wise. No, the Twin Drive skill is just there to ensure its user can make gains from it no matter what the opponent actually does. And that’s why he, too, is a 4-of staple.